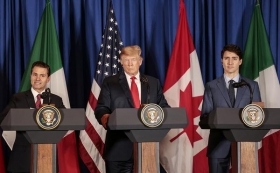 Enrique Pena Nieto, Mexico's president, left, speaks as U.S. president Donald Trump, center, and Justin Trudeau, Canada's prime minister, listen before the signing of the United States-Mexico-Canada Agreement at the G-20 Leaders' Summit in Buenos Aires, Argentina, on Friday Nov. 30. WASHINGTON -- Donald Trump’s push to get Congress to quickly pass his NAFTA replacement trade deal -- a crucial deal for the auto industry -- will require the president to take an uncharacteristic approach in negotiations: seek compromise while resisting strong-arm tactics. At stake for the president and American lawmakers is the fate of a trading bloc with about $1 trillion in annual shipments that’s lifted some industries while decimating the workers in others. For Democrats in particular, the deal provides an opening to demand concessions that favour unions and include a possible infrastructure investment package. Signed in Buenos Aires on Nov. 30 after more than a year of intense negotiations, USMCA is the biggest achievement in Trump’s trade agenda and its survival depends on whether the president can steer the agreement through fractious domestic politics. Even though it’s been signed by all three countries, it still must be ratified by each nation’s legislature -- and particularly in the U.S., that’s where it can go sideways. “The president needs to talk to Congress on this and we can get back to the table with the Mexicans and the Canadians and do stronger labour standards,” Brown told CNN.